Professor Cristina Davis joined the University of California, Davis in November 2005. She is currently a Professor of Mechanical and Aerospace Engineering, and she is the Director of the Bioinstrumentation and BioMEMS Laboratory. 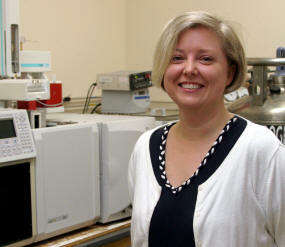 Welcome to the UC Davis Bioinstrumentation and BioMEMS Laboratory, headed by Professor Cristina Davis. Our group pursues research in the chemical sciences that spans multiple disciplines. We have complementary efforts in metabolomics, chemometrics and novel sensor engineering that are supported by multiple externally sponsored funders. One part of our group focuses on novel biomarker identification using mass spectrometry and ion mobility spectrometry methods. Another portion of our group focuses on new engineering biosensor devices to exploit this information for mobile diagnostics. Applications of our work span the medical, defense, agriculture and veterinary medicine areas. - advanced analysis methods for big data. Please take a moment to navigate our webpage and learn more about our research projects, laboratory members, and capabilities. Students looking for information regarding Professor Davis' classes should follow the "Classes" quicklink above. Individuals interested in joining our research group should look at our "Open Positions" section or contact Professor Davis directly ( ) where we collect CVs for evaluation. Do not send your CV to the UC Davis email account, which is used for all other laboratory business. Thank you for your interest in our research!